"Wind Chill" sounds like an artificial, fabricated term to make us feel better when we look at the thermometer and are convinced it feels colder outside than the mercury reads. In fact, "wind chill" is the product of an objective approach by weather specialists that is not a "feels like" marketing gimmick, but an effort to help people understand when dangerous conditions are present that may be the precursors for frostbite or hypothermia. It is expressed in familiar terms (i.e., numerical temperature readings) to help facilitate this understanding. The number itself is derived from the heat loss rate of the human body relative to its surroundings and environment as altered by cold and wind. Essentially, the "wind chill" Fahrenheit temperature represents the actual impact on your body's ability to retain heat when wind is factored in. Pretty cool, eh? As a general rule, the wind chill means that with the current/projected wind speed the temperature outside is going to be colder than the ambient temperature reading and intended to help you gauge risk. Using the example from the National Weather Service statement, a temperature of -5 degrees occurring with a 20 mph wind means that your body will loose heat at the same rate as if the air temperature is -30 with no wind. According to of partners with the National Weather Service, wind chill values near -25 degrees mean that frostbite is possible within 15 minutes. Frostbite, too, is another term that sounds less than the physical reaction is represents. Frostbite is nothing less than the freezing of your skin and - in extreme cases - your muscles, tendons, blood vessels and nerves. Areas of your skin that are exposed and where there are less blood vessels to keep the skin warm and fluids moving are more subject to frostbite, such as your fingers, toes, nose and ears. Remember, your body is primarily composed of water, right? Water freezes at 32 degrees Fahrenheit. As a result, the risk of frostbite starts when it is freezing or below freezing outside and is accelerated by additional factors such as wind - ergo, "wind chill" is a direct indication of the risk for frostbite. Also cool, huh? Not surprisingly, the best way to avoid frostbite is to be aware of weather conditions and dressing appropriately. Treatment of frostbite is similarly unsurprising and includes rewarming of the affected area, generally be getting to a stable, warm environment or slowing warming through holding the affected area next to warm skin or wrapping the affected area in blankets or additional clothing. All of these methods seem slow.... Why not rub, massage, shake or apply physical force to warm the affected area? Because, the skin is frozen. In certain cases, the fact that the tissue may contain ice crystals means that physical force such as described may cause further damage and pain. Hypothermia, on the other hand, sounds about right for the condition. Hypothermia is when the body's core temperature (normal 98 - 100 degrees) drops to a point where normal functioning is impaired. Hypothermia can occur even when it is not freezing because your body is constantly involved in maintaining a core temperature of 98 degrees. Meaning, even if it is above freezing, such as 50 degrees outside, but your body is fighting conditions such as ample food supply, cold or wet clothing or other variables, your core temperature can dip below the Goldilocks region of 98 degrees, causing hypothermia. Consequently, hypothermia is the most common winter killer. Complicating one's ability to fight off hypothermia is that many of the initial warning signs that hypothermia is occurring is a reduction in cognitive functions, such as memory loss, disorientation, slurred speed and drowsiness. Uncontrollable shivering may also take place as the body tries on its own to produce heat through movement. Like frostbite, the best way to meet the challenge of hypothermia is through prevention, including understanding weather conditions, eating/hydrating properly and wearing appropriate clothing for conditions. It is also important that, if you are outside with others such as hiking, climbing or hunting, that your group are educated on and familiar with the signs of hypothermia. Unlike frostbite where you know your fingers are cold and have the competency to do something about it, hypothermia may not enable you to think clearly or articulate properly to others that you need help. Hypothermia treatment includes, again unsurprisingly, warming the person in a stable, warm environment using blankets, dry clothing/skin contact and warm liquids. So, this winter - Stay Dry. Stay Covered. Dress in layers. Stay Informed. And, Stay Alive! The Denver Urban Area Security Initiative and the North Central All-Hazards Region will host an Incident Command for Single Resources (ICS-200) training on April 5-6, 2011, at the Colorado Department of Public Health and Environment in Denver, CO. The course will cover ICS features and principles, including: establishment and transfer of command, incident action plans, unified command, ICS management functions, organizational flexibility, unity and chain of command, spand of control, management by objectives, resource management, common terminology, integrated communications and personnel accountability. Course registration is occuring through the UASI/NCR Training Office. For questions/registration info, contact Tom Witowski at (720) 865-7651 or at tom.witowski@denvergov.org. The Division is hosting two Rapid Needs Assessment (G.250.7) courses in the near future. The first course will be held February 22, 2011 at the Southwest County Service Center in Longmont, Colorado. The second course will be held on April 7, 2011 at the Douglas County Sheriff's Office in Highlands Ranch, Colorado. The G250.7 Rapid Needs Assessment Course is a required course in the Advanced Professional Series. The course teaches the need and development of plans/procedures for rapidly and efficiently collecting disaster intelligence (lifesaving) following a disaster. This intelligence can rapidly be used to develop response prioriteis, allocate available resources and specifically requrest resources from other sources to save and sustain lives. Registration for both of the courses will be through http://www.co.train.org Course ID: 1024910 and for more information, contact DEM's Training Officer, Robin Knappe at robyn.knappe@state.co.us or at (720) 852-6617. Just a note that the National Integration Center (NIC) has released the National Incident Management System (NIMS) Training Plan for public comment. Comments on the DRAFT NIMS Training Plan are due by February 22, 2011 and the document can be found online at http://www.regulations.gov (Docket #FEMA-2009-0012). The comments are intended to provide insights to stakeholders and to seek comments on current and future NIMS training. Hosted by the Colorado Division of Fire Safety, Colorado's National Fire Academy Weekend is coming up from February 10-13, 2011 at the Starter Hotel in Durango, CO. Course offerings include Incident Safety Officer, Leadership I: Strategies for Company Success, The Chief Officer Training Course: Human Resources, and more. For any questions or assistance, call the Colorado Division of Fire Safety at (303) 239-5847 or email penny.lee@cdps.state.co.us. Our partners at the Federal Emergency Management Agency are asking for input on one of their working papers regarding ideas for strengthening public participation in emergency management and homeland security. With the goal of learning what works well in local communities before an incident occurs and connect those lessons learned to other interested communities, FEMA has develop a working paper, titled "Policy Challenges in Supporting Community Resilience". Specifically, FEMA is looking for input on whether the themes and concepts in the paper resonate with you and are there additional themes to consider? FEMA is also seeking your opinion on whether you have seen greater resilience in places where communities have engaged in emergency management activities and, if applicable, examples of such successes. To access the paper, you can go to http://www.fema.gov/library/viewRecord.do?id=4563 and submit reactions to FEMA-Community-Engagement@dhs.gov by Monday, Feb 11, 2011. The Colorado Division of Emergency Management (CDEM) is pleased to announce that FEMA approved the updated State of Colorado Natural Hazard Mitigation Plan on January 3, 2011. State-level hazard mitigation plans have to be updated every three years to maintain statewide eligibility for FEMA's hazard mitigation grant programs, Flood Mitigation Assistance Grants, and certain types of post-disaster Public Assistance. CDEM's Mitigation team, in partnership with local jurisdictions, state and federal agencies, and non-profit organizations, worked since March 2010 to review and revise the previous version of this plan. Updates include a revised comprehensive Hazard Identification and Risk Assessment, an evaluation of actions taken by the State to reduce risk over the past 3 years, an entirely new mitigation action plan for the State and a new Colorado Rural Electric Natural Hazard Mitigation Plan. In addition, the Colorado Water Conservation Board managed the updates for the Colorado Drought Mitigation and Response Plan and the Flood Mitigation Plan for Colorado, which both serve as supporting documents for this plan. The Colorado State Forest Service coordinated an update to the Colorado Wildfire Mitigation Plan. Each of these plans helps Colorado to continue and to strengthen efforts to reduce vulnerability from hazards to people, property and infrastructure. CDEM would like to express gratitude to all who helped throughout the planning process. These stakeholders include local emergency managers, non-profits, State agency partners and Federal partners. If you have any questions or comments related to the plan, please forward them either to Ken Brink (kenneth.brink@state.co.us) or Iain Hyde (iain.hyde@state.co.us). The Southeast Colorado All-Hazards Region is requesting proposals from qualified individuals to fill the position of Regional Homeland Security Grant Coordinator. The Regional Coordinator is responsible for administering and managing State Homeland Security Grant Programs and is the central point of coordination for programmatic issues within the region. The Southeast Colorado All-Hazards Region consists of Baca, Bent, Crowley, Kiowa, Otero and Prowers Counties. For more information on this request and to receive an application package, contact Riley Frazee, Baca County Office of Emergency Management at (719) 529-0300 or bacaeoc@aim.com or visit http://www.seregion.com. The proposal deadline is February 2, 2011, at 5:00 pm MDT. The Environmental Protection Agency, Colorado Department of Public Health and Environment, Tri-County Health Department and South Adams County Fire Department have teamed up to offer a 40-hour Health and Safety Training course: Hazardous Waste Operations and Emergency Response (29 CFR 1910.120 (e)(3)(i) from February 28 - March 4, 2011. The training will take place in Commerce City at the South Adams County Fire Protection District Station 1. The course will meet expectations for deployable CO Emergency Management Assistance Compact Environmental Health professionals teams and will cover superfund regulations, site assessments, sampling techniques, monitoring equipment, personal protective equipment and emergency response. To register, go to https://www.co.train.org and search for Course ID: 1025541. For any questions about the training, contact Robin Koons, PhD, at robin.koons@state.co.us or at (303) 692-2719. As an Emergency Management Field Manager, this position coordinates with and provides emergency management technical assistance to local government emergency management organizations in South and Southeast Colorado prior to, during and following a major emergency or natural disaster. The emphasis is on preparedness actions to improve local and state response and recovery to all hazards emergencies. The position strengthens local and regional capability through development and validation of emergency plans, policies, training and exercises with first responders and local elected/appointed officials; fosters interagency and inter-jurisdictional mutual aid cooperation; and implements public emergency preparedness education programs and awareness. In addition, position provides technical assistance with grant administration and ensures compliance with contract and reporting requirements by conducting on-site visits with assigned jurisdictions; assists local governments with hazard analyses, supports local and regional efforts to assess all hazards threats and risks; assists in presentations and provides training courses for emergency management personnel and first responders. MINIMUM QUALIFICATIONS: Qualified applicants must have a bachelor’s degree from an accredited college or university in a related field AND three years of professional experience in emergency management planning and response operations. SUBSTITUTION: Professional experience in emergency management planning and response operations which provided the same kind, amount and level of knowledge acquired in the required education may be substituted for the bachelor’s degree on a year-for-year basis. Necessary special requirement: Must possess and maintain a valid Colorado driver's license. Background check required. PLEASE NOTE: Applications are used as part of the selection and exam process. Applications will be reviewed to determine if you meet the minimum requirements for the position and will be ranked to determine the most qualified applicants for this position. Be sure your application specifically addresses all the requirements listed above. HOW TO APPLY: Applications are available on the Dept. of Local Affairs' employment website at http://dola.colorado.gov/employment.html. To apply submit your completed State of Colorado Employment Application for Announced Vacancies and a current resume directly to the Department of Local Affairs, Human Resources Office, 1313 Sherman Street, Room #315, Denver, CO 80203, or fax 303-866-2251, by 5:00 p.m. on the announcement closing date. If your application and resume are not received by the closing date of this announcement, you will not be considered for this position. If you have any questions, please contact Susie Esparza at 303-866-5884 or email susie.esparza@state.co.us. Please include your current e-mail address on your application, as most correspondence regarding this position will be electronic-based. The department cannot guarantee the successful delivery of e-mail. You will be notified of the status of your application two weeks after the closing date of the announcement. If you do not receive information regarding the status your application after this time, please contact (303) 866-5884. Failure to complete and timely submit the application and resume may result in your application not being considered for this position. The application and related documents must be received (postmarks will not suffice) by the Human Resources Office by 5:00 PM on the closing date listed above. For employment application and full job announcement including Important Information About Your Application and Appeal Rights please visit our employment website at http://dola.colorado.gov/employment.html. As you are no doubt aware, the Colorado AMBER Alert Program is a voluntary partnership between law-enforcement, media, transportation and others to send bulletins about child-abduction cases. A new resource in this alert system was added today through the establishment of the Colorado Amber Alert page on Facebook. To receive alerts in Colorado, become a "fan" of the page and alerts will be posted to your news feed in Facebook. In addition, the page has the option to also "subscribe via sms". Given the ever-present threat and history of wildland fires in Colorado, one of our Division's closest partners is the Colorado State Forest Service, or CSFS. In Colorado, the CSFS is the lead agency for wildfire response and the lead Emergency Support Function during a state wildfire declaration. In their capacity as the organization responsible for managing and extinguishing fires that go beyond the capability of locals, a 'must read' for anyone in Colorado's emergency management community is the CSFS Wildfire Briefing for 2011. During a wildland fire, our Division's task is to help support the CSFS and to help coordinate our actions and those of other state Emergency Support Function agencies involved in State emergency operations in support of the CSFS. For more on the role of the CSFS in wildland fire and for contact information, check out the CSFS Wildfire Page. Video highlights from the Shared Strategies for Homeland Security Conference. Two CEMA members provide a nomination letter about the Regional or Rookie Award nominee. This letter will state the reason why the nominee should receive the specified award. The Rookie of the Year should have been in the position for two years or less. The CEMA Awards Committee will accept nominations from the general membership not later than thirty (30) days prior to the Annual Meeting to recognize contributions to the field from each of the nine all-hazard Regions within the State of Colorado. 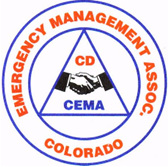 Awards are to recognize one or more CEMA members, regardless of membership status, who has contributed significantly to the Association and/or overall emergency management within the State of Colorado during the preceding year. Colorado Earthquakes – Vince Matthews, Ph.D. NOTE: Thursday’s workshops are also available as “stand alone” sessions and must be pre-registered to attend. Individual fliers for Thursday’s sessions can be viewed on CEMA’s website. Session titles and speakers can be subject to change. Final agenda will be available March 1st. The Federal Emergency Management Agency (FEMA) Individual and Community Preparedness Division will host a Community Preparedness Webinar on "Collaborative Planning - Engagement of the Whole Community" on January 11, 2011 at 12:00 PM Mountain Time. The webinar will provide participants with an introduction to emergency planning and will include specifics on how to engage the right people into community planning teams. In addition to the resources to be addressed in the webinar, if you are interested in other materials for community planning and citizen preparedness, be sure to check out the Citizen Corps Individual and Community Preparedness Resource Library. With specific assistance guides and links for general preparedness, individual preparedness for parents, families, teachers, volunteers, businesses, and neighborhood groups, the site is a must-bookmark for a ready-to-use community preparedness planner. The Blue Cell will be hosting an Advanced Planning Concepts: Developing Incident Action Plans course (State Sponsored Catalog #NE-001-COMM) at Aurora Community College's Disaster Management Institute in Denver from February 24-25, 2011. The course is designed to immerse participants in the usage and understanding of the New ICS Forms released by FEMA in December 2010. The course will also instruct the Advanced Planning Process, and several other advanced planning products and techniques. For further information and registration, download the Advanced Planning Concepts course flyer or contact admin@thebluecell.com. If you are involved in public safety or education efforts for an emergency management or first responder agency in Colorado you are, no doubt, familiar with the Fire and Life Safety Educators Annual Conference of the Rockies. Now in its 17th iteration, this year's Conference will include a Keynote by Tricia Downing, who will bring her unique insights and views on injury prevention, recovery and resiliency issues. From legal issues, to public event marketing assistance, to junior firesetter interview workshops, to wildfire mitigation education efforts, the conference will over a lot of variety and opportunity for participants to engage with their peers. More information can be obtained from the brochure embedded below or it you can download the flyer. An ICS-400 Advanced Incident Command System course will be held Feb 9-10 in Colorado Springs. The course is designed for ICS or general staff, select Department heads with multi-agency coordination system responsibilities, area commanders, emergency managers, and multi-agency coordination system/emergency operations center managers. Registration for the course will be handled through CO.TRAIN (http://co.train.org) Course ID: 1006001. For questions regarding the registration or the course, contact DEM's Training Officer, Robyn Knappe, at robyn.knappe@state.co.us or at (720) 852-6617. Hotchkiss Fire Protection District will host an ICS-300 Intermediate ICS Principles Course in Hotchkiss, CO, from Jan 27-28, 2011. ICS-300 provides training on and resources for personnel who require advanced application of the Incident Command System (ICS). The course expands upon information covered in the ICS-100 and ICS-200 courses. Registration will be handled through CO.TRAIN (http://co.train.org) - Course ID: 1005860. For any questions about the course or registration, contact DEM's Training Officer, Robyn Knappe, robyn.knappe@state.co.us or at (720) 852-6617. To assist communities and industry to prevent and deter criminal and terrorist acts that target the agriculture and food sectors, the U.S. Department of Homeland Security and the University of Tennessee, College of Veterinary Medicine have developed the Agriculture and Food Vulnerability Assessment Training (MGT 332). The course, which can be brought to local communities, introduces assessment methodologies that can be used to evaluate vulnerabilities in agriculture and food systems as well as for individual facility analysis. The instructional team, equipment and all materials are provided at no cost. For more information or to submit an application for your community, download the Agriculture and Food Vulnerability Assessment Training Course Flier and contact DEM's Training Officer, Robyn Knappe at robyn.knappe@state.co.us.